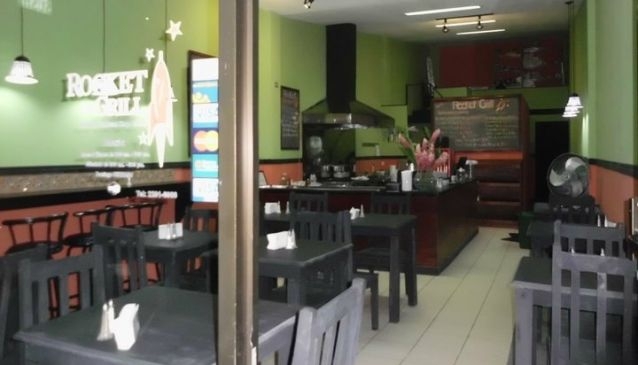 Serving breakfast, lunch and an early dinner the Rocket Grill has the perfect menu for all those cravings you have for familiar foods. Featuring a variety of American favorites as well as vegetarian selections, they are reasonably priced with a small dining room in order to enjoy your meal. While they serve a full hot American breakfast, it is the BBQ and sandwiches that seem to draw the visitors to their location. The sandwiches and side orders will not leave you hungry and in most cases you may not be able to finish the sizable portions they serve. Light dinner meals like spaghetti, salads, fajitas and Cordon Bleu, just to name a few, allow everyone to find a favorite dish they can enjoy at Rocket Grill.